Almost 70% of children in Uganda who enroll in primary school are likely to drop out before finishing the prescribed seven years. The causes of this exodus are complex but are inextricably linked to poverty and the fact that despite almost $302 million in annual government spending on primary education and Uganda’s place in the history books as one of the first African nations to introduce “free” Universal Primary Education, education is still not free. One of the major persistent barriers to education access today are the hidden fees that parents are forced to pay to put their children through school. 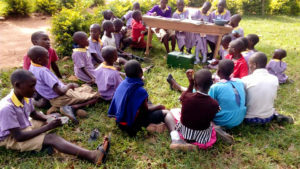 From classroom supplies like books and pens to other materials like uniforms, school meals, and even clothing, parents across Uganda struggle to keep up financially. For rural parents, who are the most economically disadvantaged and often living on less than $1 per day, these costs can prove prohibitive, even if a quality school does exist in their communities. 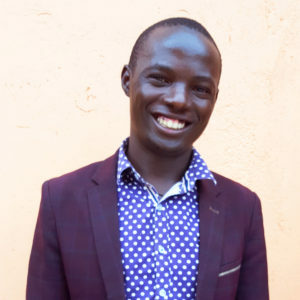 Former Building Tomorrow fellow Stephen Katende is on the front lines tackling these issues with his youth-centered organization Kisoboka Africa, which was born out of his time working with rural communities surrounding the Building Tomorrow Primary School of Lukindu in southern Uganda. 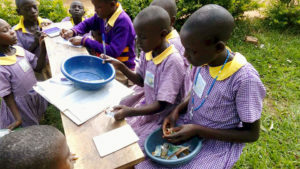 Kisoboka Africa, meaning “It is possible” in the local Luganda language, recently received international recognition from the royal family in the United Kingdom for the example it is setting and the headway it is making in encouraging parents to save, borrow, and invest for their children’s education. As a winner of the highly competitive and prestigious 2018 Queen’s Young Leader Award recognizing exceptional young leaders from across the Commonwealth dedicated to making lasting change in their communities, Stephen will have the opportunity to travel to the United Kingdom to collect his award from Her Majesty the Queen herself and partake in a one-week residential program and package including training, mentoring, and networking. Building Tomorrow recently had the chance to sit down with Stephen to discuss Kisoboka Africa and reflect on this incredible opportunity. 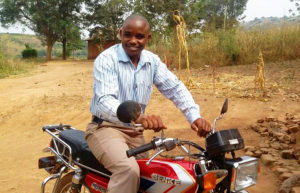 Enos, who started saving with the School Community Bank of the Building Tomorrow Primary School of Kabasegwa, has been able to borrow enough money to purchase a motorcycle to perform taxi rides and improve his income to pay for his child’s school fees. But Kisoboka Africa is not stopping there. Taking its model a step further to work with children themselves, Kisoboka Africa promotes Young Saver and Investment Clubs in primary schools to teach children how to save money, as well as instill a savings culture and leadership skills to help them be successful in the modern economy. As Stephen explains, “In rural communities, people think they are too poor to save,” so changing the mindsets of the poor at a young age is key. Children of the Building Tomorrow Academy of Lukindu save money for their own education through their Young Saver and Investment Club. Stephen, who was part of Building Tomorrow’s first cohort of fellows, says the program has shaped him on his journey with Kisoboka Africa in many important ways. Before the fellowship, for example, Stephen says he could not stand in front of a group of people to convince them of an idea—a skill which he gained from the fellowship program’s emphasis on community mobilization and public speaking, and which has been invaluable for him and the genesis of Kisoboka Africa. In addition to this, the skills and knowledge that were imparted surrounding social entrepreneurship, community problem identification, and, most of all, teamwork have been instrumental in moving Kisoboka Africa forward. Stephen humbly points out that none of these successes would be possible without the efforts of his colleagues, Bruce Tushabe and Daisy Naluwugge, who are also former Building Tomorrow fellows, as well as the hard work of Kisoboka Africa’s two dedicated volunteers in the field, who put one foot in front of the other each day to improve education without receiving a single shilling. Building Tomorrow is proud of Stephen Katende, as well as his colleagues Bruce Tushabe and Daisy Naluwugge, for their leadership and achievements with Kisoboka Africa. We wish them all the best of luck and support as they continue to grow Kisoboka Africa, and look forward to seeing where they go next!